If the desire to design the perfect website for your software company has you stressing, not to fret. Why? 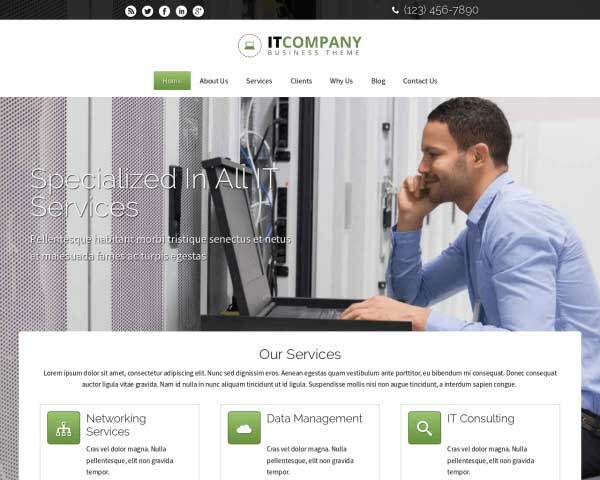 The IT Consulting WordPress Theme aready comes with everything that you need to communicate your business' strengths. Best of all, since you need only replace the default content with your own, you can be up and running with little downtime, if any! 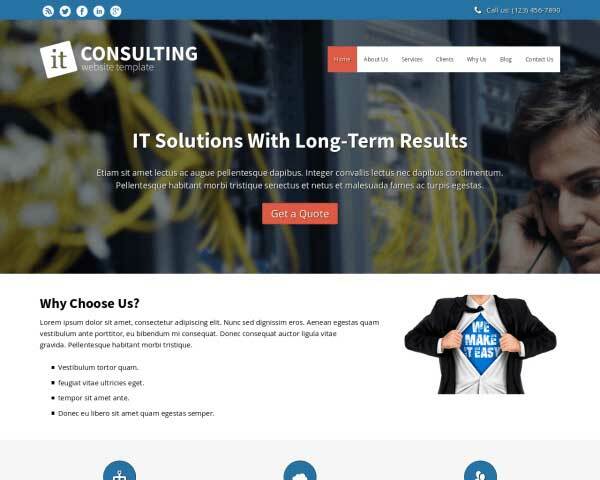 A great-looking website for your IT consulting business reinforces the message that you and your team are tech-savvy professionals. 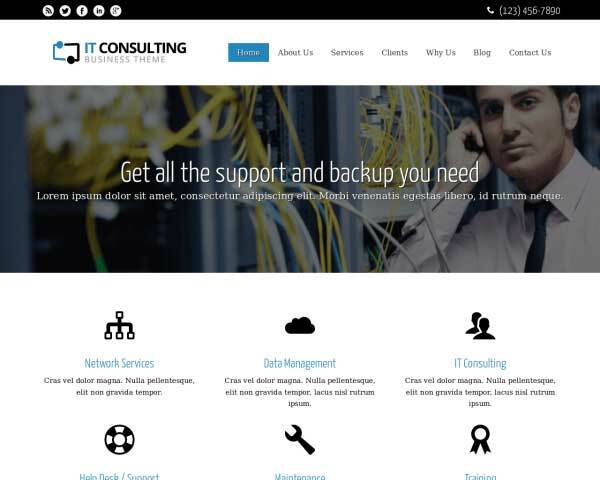 Our IT Consulting WordPress theme makes it easier than ever to get a sleek, informative website online fast, without any coding or extra plugins required. Pages for details about your IT services, company approach, staff overview and more are already set up and ready for your own text and images. Using our unique front-end editor, you'll be able to customize the color and styling of your content with just a few clicks. Drag and drop widgets allow you to rearrange page layouts and add new features in seconds. We've included powerful business features to help you get the most out of your new site, like integrated social media options and a built-in SEO manager that can help increase search rankings. 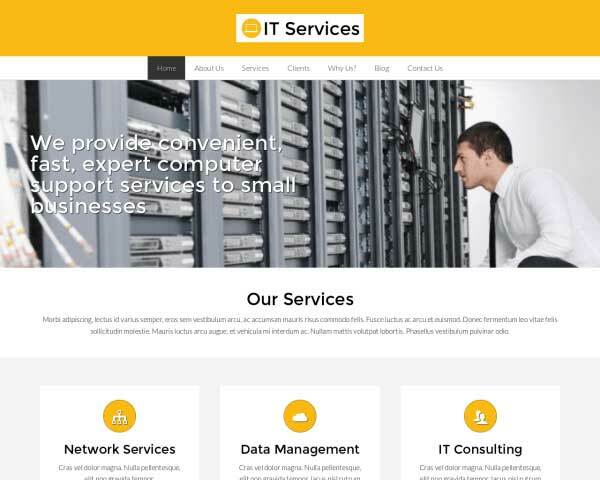 With the IT Consulting WordPress theme, you can easily build a responsive website for your IT business that will attract new clients and make a professional impression online, even if you've never built a website before. 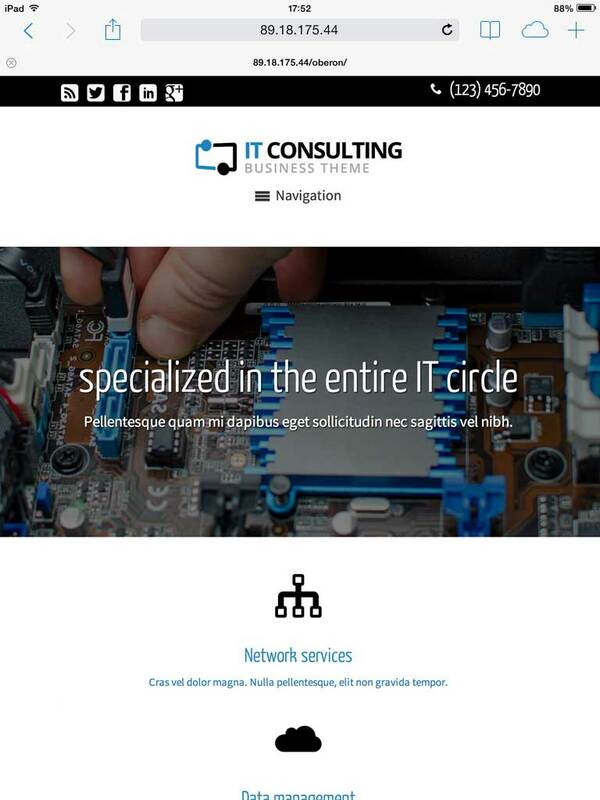 The IT Consulting WordPress Theme provides an easy way to showcase the team of professionals that surround you on a dedicated team overview page. You'll never run out of options when promoting your services. An easy-to-use page builder ships with the IT Consulting WordPress Theme. Share previous project successes and client cases. And convince your prospects why your the best IT company in town. 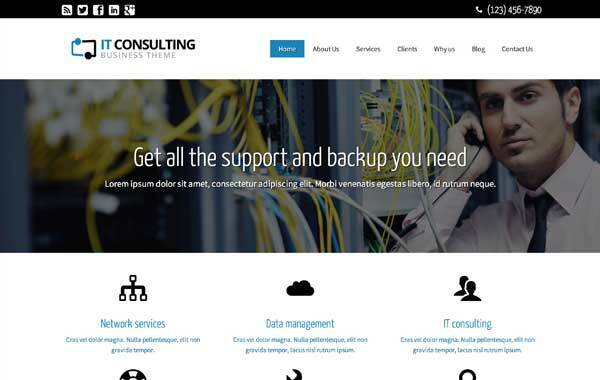 The IT Consulting WordPress Theme will let you quickly adjust existing pages and add new ones. With beautiful features to choose from that enhance the design. A staple for any website is the blog or news section. Use the existing one or add any amount of categories you'd like to add. With the included form functionality you have a simple but powerful way for potential clients to get into contact with you. A website should be able to drive new business to your doorstep. 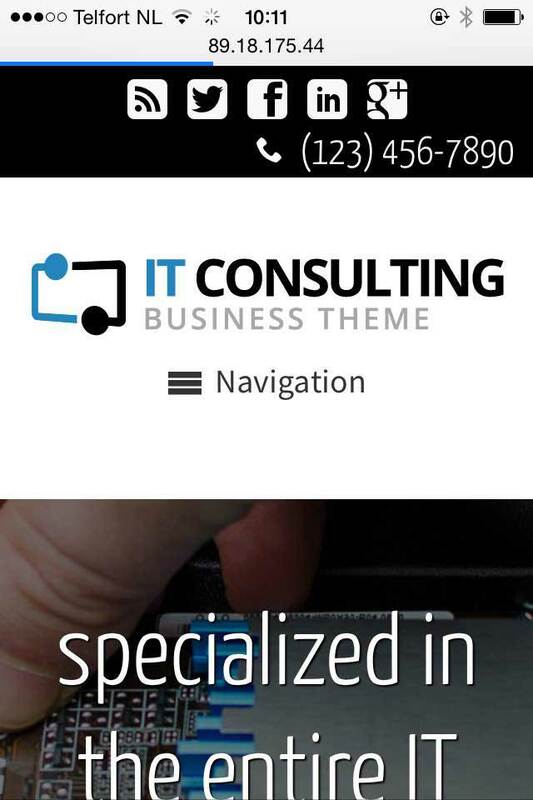 The IT Consulting WordPress Theme does that for you with the right call-to-actions. With a neat layout, your services attract the attention they deserve. And provides clients with the right information at the right moment. You have probably already received a lot of praise for your past work. 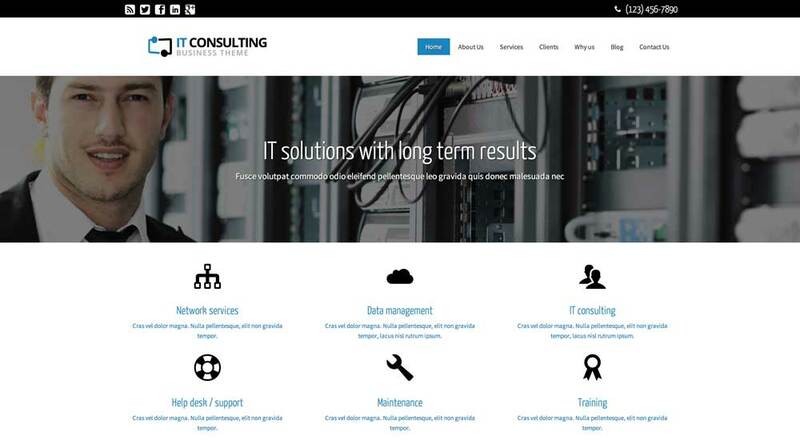 Showcase right on the homepage of the IT Consulting WordPress Theme. As an IT consultant, it's important for your website to show visitors that you're up-to-date with the latest technology. Make sure that visitors accessing your website on smartphones and tablets experience the same professional look and design of the desktop version with the responsive IT Consulting WordPress theme. We've built this premium website template with a mobile-optimized design that will automatically adjust the layout of your content to render beautifully on any screen size. Mobile visitors can simply tap on your phone number or a call-to-action button to dial.